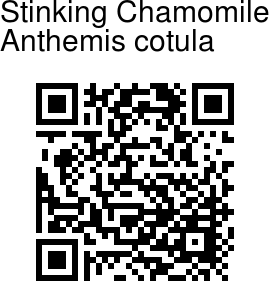 Stinking Chamomile is so-named for its resemblance to the true chamomile plant, Anthemis nobilis. It is an annual herb, with finely dissected leaves, that may reach 2 ft in height. Leaves are alternate, finely dissected, approximately 1.8-3.5 cm long and 2.5 cm wide. Leaves emit an unpleasant odor and may have some short hairs. Flowers ar eborne in solitary heads at the ends of branches. Flowers are approximately 1.6-3.3 cm in diameter and are white (ray florets) with yellow centers (disk florets). White ray flowers have 3 distinct teeth. 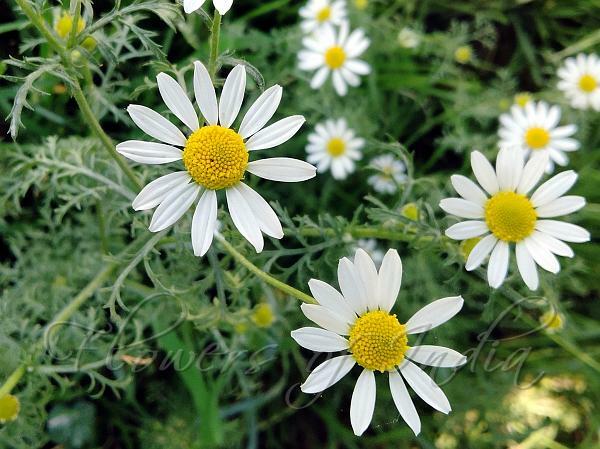 Stinking Chamomile is a plant of Europe and West Asia, but now widely naturalized on all continents. Medicinal uses: The flowers are preferred for internal use, tasting better than the leaves. In hysteria it is used in Europe as an antispasmodic and emmenagogue. Applied to the skin fresh and bruised it is a safe vesicant. A preparation helpful in piles can be made from the herb boiled until soft. It is used to induce sleep in asthma. A strong decoction can cause sweating and vomiting. It is believed to be almost as important as opium in dysentery.